Open safari vehicles usually in the form of a Range Rover or Land Rover are exceptional vehicles to handle the diverse terrain of a Tanzanian Safari. These vehicles basically have no internal framing and are completely open, with the ultimate design for game viewing. Clearer View – When on safari in an open vehicle, there is nothing between Tanzania’s wilderness and you. It is easier to look at the wild animals surrounding you and take photos. Not to mention, smells are easier to pick up and sounds are more easily heard. Better Seating – Most open safari vehicles have the capability of seating nearly 8 passengers, while providing a personal experience for each. The seating is gradually tiered with the front benches slighter lower than those in the rear, providing optimal visibility and photography. Drivers & Trackers – Open safari vehicles usually have a highly-experienced tracker sitting on the front of the car, hence enabling him to track dung, spoor, and wild life threats. They allow everyone to see the best Tanzania has to offer in wildlife. No Protection from Rain – Many open safari vehicles have open sides and no roof, which means they do not provide any protection in cases you get caught in the odd rainstorm. Less Safer – Upon encountering predators like leopards or lions, your guide may need to stop as the tracker will need to climb into the front seat. This poses passengers at a certain level of risk, as the vehicle has to stop for a brief moment. No Automobile Siding – Open safari vehicles lack typical automobile siding, similar to that of the American Jeep Wrangler. This poses tourists at risk of potentially wild animals. No AC – The drawback of an open safari vehicle is that they can become very hot as they often do not have air conditioning and you may be in direct sunlight. Closed safari vehicles are perfect for the varying rugged to sandy landscape of the Tanzanian safari. These vehicles are modified to provide the highest safety and have raised seats, allowing for better views over the landscape. Windows and Pop-Up Roof – These vehicles basically have large windows – some of which open horizontally and others vertically. Many also have a pop-up roof, enabling tourists to get 360-degree views and photos, while being incredibly safe due to the vehicle’s closed structure. Better Storage – These trucks offer plenty of storage space for equipment and luggage. Some offer storage via a detachable trailer and others under the seating section. Modern Gadgets – Some of the latest closed safari vehicle models come fully equipped with modern gadgets, enabling you to charge your camera’s, smartphones, and listen to your own music while watching the Tanzanian landscape slide by. More Safety – In a closed safari vehicle, every passenger is guaranteed a window seat. The large windows can be rolled down completely allowing for great wildlife viewing, while offering lots of safety. 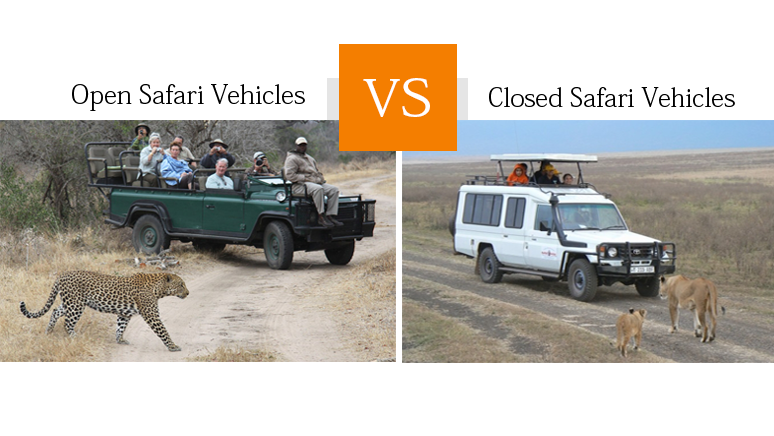 As you can see, open and closed safari vehicles both have their own pros and cons. However, if you want to view the wildlife in the best way possible (while being incredibly safe), closed safari vehicles are definitely the most appropriate option especially as they have been customized specially for safari and provide optimal viewing with safety.